LIFELINE SRK - MOOSE SAFETY SUPPLY, INC.
​Manufacturing the LIFELINE SRK™ Tactical Self-Extrication Tool involves numerous complex processes. The LIFELINE SRK™ Tool is such a uniquely engineered, patent-pending, concept that it can only be manufactured by drawing from the most state of the art processes in various fields of technology. In order to achieve this, FSI partners with Phillips Precision Medicraft of New Jersey, which is a leading manufacturer of advanced orthopedic implants and medical instrumentation. What makes the LIFELINE SRK™ Tool so unique is, among other things, its thickness and proprietary serrations. After the manufacturing is completed, what you have is a 3/16” thick marvel of engineering science that can cut through most difficult materials. Indeed, the LIFELINE SRK™ Tool is significantly thicker than a knife, yet thinner than most cutting tools or devices. Not a knife, not a cutting tool, but LIFELINE SRK™. In addition, LIFELINE SRK™ is manufactured with heat resistant component parts and is designed to meet or exceed NFPA 1982. The manufacturing process commences by using American-made 440c stainless steel that has a high carbon content and is considered to be one of the highest end steels. Sheets of the 440c stainless steel are precision flat grinded to a standardized 3/16’ thickness. The profile of the LIFELINE SRK™ Tool is achieved by using a high powered CO2 laser cutter. 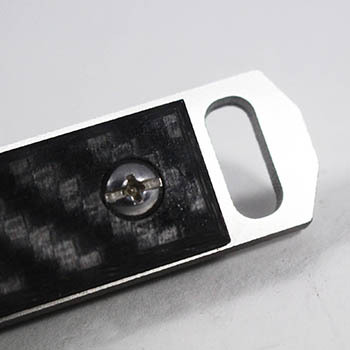 By using the laser cutter, instead of, for example a water jet, the stainless steel around the profile edge is vaporized by a jet of gas, leaving the LIFELINE SRK™ Tool’s edge with a high-quality surface finish. 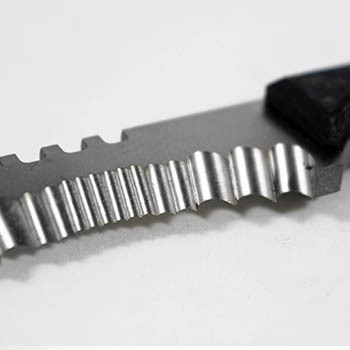 The unique and proprietary serrations on the LIFELINE SRK™ Tool are achieved through a highly time consuming and technologically advanced machining process. 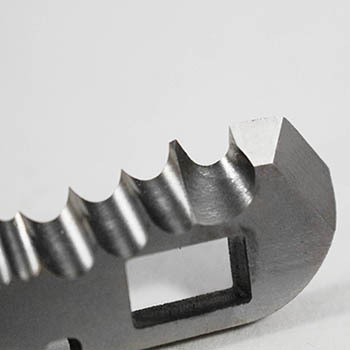 The proprietary serrations are formed through 5-axis machining using a 5-axis mill. 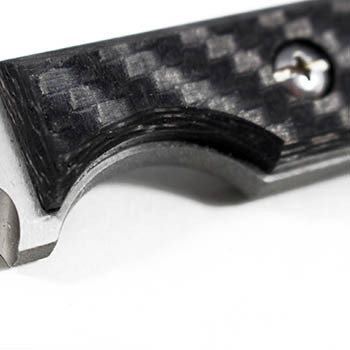 So complex are the serrations that it takes over an hour of constant computerized machining to form the serrations on just one LIFELINE SRK™ Tool. ​The LIFELINE SRK™ Tool is then heat treated to a Rockwell of 59-60, then given a cryogenic treatment whereby each LIFELINE SRK™ Tool is slowly cooled in a controlled bath of liquid nitrogen. This highly advanced heat treat process improves the microstructure of the 440c stainless steel, decreases residual stresses and increases toughness and dimensional stability. The LIFELINE SRK™ Tool then goes through a rigorous finish process whereby fine glass beads are applied at high pressure to the entire profile edge, which leaves a slightly coarse surface for increased grip. 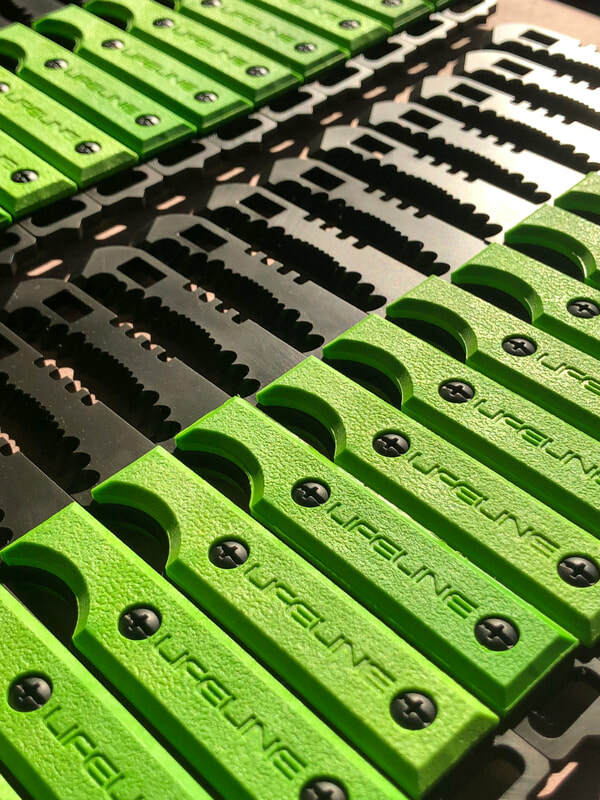 The LIFELINE SRK™ Tool is then precision flat grinded one last time and detailed fit and finished to the highest of manufacturing standards. The final product is a perfectly polished instrument with highly aggressive proprietary serrations that can cut through most difficult materials. The handles on the LIFELINE SRK™ Tool are just as technologically advanced. 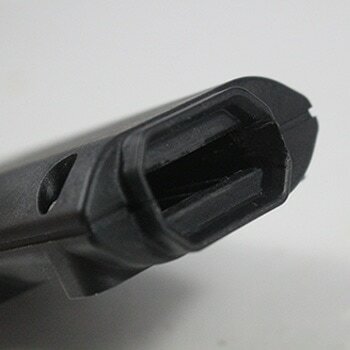 The base model handles are high temperature injection molded using DuPont Zytel® Heat Resistant Thermoplastic and have a melting point of approximately 600 °F. The upgraded handles are made of Carbon Fiber-Reinforced Carbon and precision cut by FSI’s CNC routers. The carbon handles have a melting point of 3600 °F and is the same material that was used on the wings of Space Shuttle. The only technology that equals the LIFELINE SRK™ Tool is that of the LIFELINE SRK™ Sheath. Designed and engineered over several years, the LIFELINE SRK™ Sheath was created to hold the LIFELINE SRK™ Tool with a proprietary fastener that allows for a single-handed release in emergency situations. 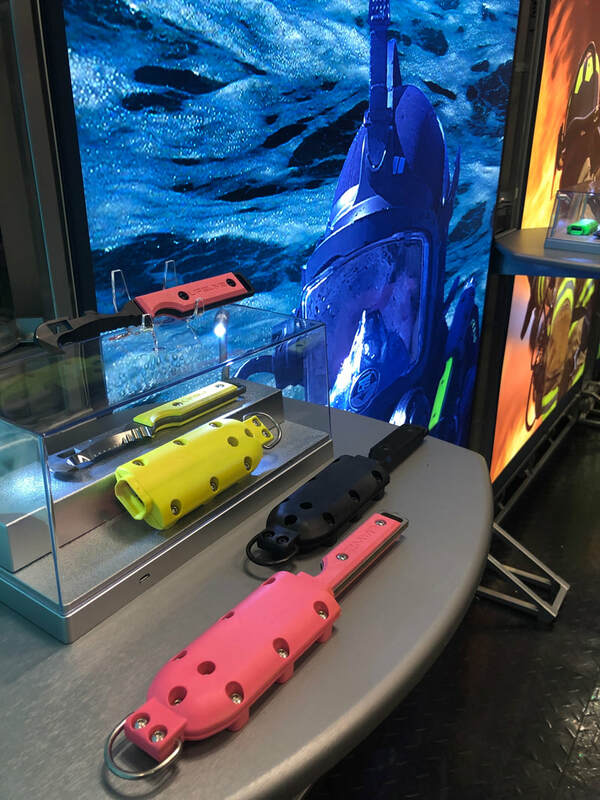 The LIFELINE SRK™ Sheath also is high temperature injection molded using DuPont Zytel® Heat Resistant Thermoplastic and has a melting point of approximately 600 °F. 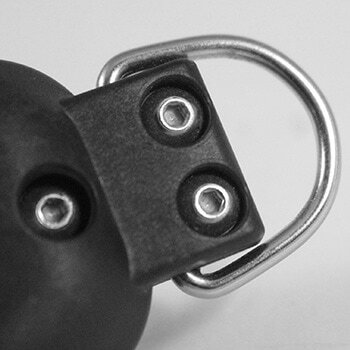 The LIFELINE SRK™ Sheath is manufactured with a tempered steel D-Ring for fastening to S.C.B.A. harnesses to hang vertically for a quick single-handed release. The LIFELINE SRK™ Sheath is also designed to attached to military and other rescue service vests.